A memorial marker for First Lieutenant Frank Black Morgan (1920-1944) at Parker Presbyterian Cemetery in Parker, Pennsylvania. 1st Lt. Morgan was born in Greensburg, Pennsylvania, on January 28, 1920, to Samuel Morgan and Edna Grace Morgan. Samuel Morgan was a first generation American of Northern Irish descent, working in the publishing industry as an editor and linotype operation. Edna Morgan (née Black) was a native of Pennsylvania. 1st Lt. Morgan had two older brothers: Samuel Cree Morgan (1909-1990) and James Alexander Morgan (1912-1982). The Morgans owned a home on 17 Clopper Street in Greensburg, where 1st Lt. Morgan resided until he entered active service on April 27, 1942, out of Pittsburgh, Pennsylvania, at the age of 22. 1st Lt. Morgan trained at MacDuill Field, a U.S. Army Air Corps which would become MacDill Air Force Base in Tampa, Florida, and then served with the 555th Bomber Squadron, a unit within the 386th Bomber Group. 1st Lt. Morgan served his country with distinction, earning an Air Medal with Eight Oak Leaf Clusters. He died on December 20, 1944, four days into the Ardennes Counteroffensive, also known as the Battle of the Bulge. His death is listed as non-battle related, suggesting that he may have been one of the many Martin B-26 Marauder crashes at takeoff or upon landing. 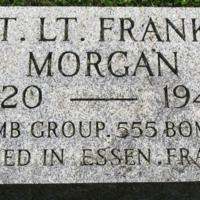 1st Lt. Morgan died just before the of the end of World War II at the age of 24. 1st Lt. Morgan is buried in Plot B, Row 39, Grave 46 at Epinal American Cemetery and Memorial in Dinozé, France. Original GRid=32415773" target="_blank">color digital image by Marsha Black. Originally created by Marsha Black. Copyright to this resource is held by Marsha Black and is provided here by RICHES of Central Florida for educational purposes only. "Headstone Inscription and Interment Record for First Lieutenant Frank B. Morgan." RICHES of Central Florida. "Samuel Morgan, Jr." FamilySearch. https://familysearch.org/ark:/61903/1:1:MG89-24H. "Frank B Morgan." FamilySearch. https://familysearch.org/ark:/61903/1:1:XHHK-PHR. "Frank B Morgan." FamilySearch. https://familysearch.org/ark:/61903/1:1:KQNX-5LJ. The 386th Bomb Group. 1945. "WWII Army Casualties: Florida." National Archives. https://www.archives.gov/research/military/ww2/army-casualties/florida.html. Black, Marsha. “Memorial Marker for First Lieutenant Frank Black Morgan at Parker Presbyterian Cemetery.” RICHES of Central Florida accessed April 22, 2019, https://richesmi.cah.ucf.edu/omeka/items/show/9434.